I am writing this out of chronological order, but wanted to talk about my last evening in Phuket. I’ll update more on the Centre a little later. I spent my last few nights of my Thailand adventure in Phuket. I traveled there on advice from a travel agent, and at the time of booking had thought it would be a wonderful idea to go somewhere to relax for a few days after working – and before returning back to my job in New Zealand. Of course, I arrived in Phuket after a short flight from Bangkok following my departure from removed rural Thailand and was instantly hit with the culture shock – so many people; so many tourists; so different to the gorgeous, idyllic Thailand I had grown to adore. I stayed at a resort on Kata Beach – it was sunny and beautiful, but again far too touristey for me. A while ago, before I had grown more self-confident, I would have enjoyed the resort with its western-welcoming holiday destination atmosphere. Now, though, I know I’ve far surpassed that. I felt out of place, and too much like I was wasting time. I had to force myself to remember I only had a few days left in Thailand and that I’d be back to work just over 12 hours after getting back to New Zealand, so I had better enjoy my time off! During my stay another girl from WFFT came by for a couple of nights – it was nice to hang out with someone I had been at the Centre with, and was great not to be by myself the whole time. 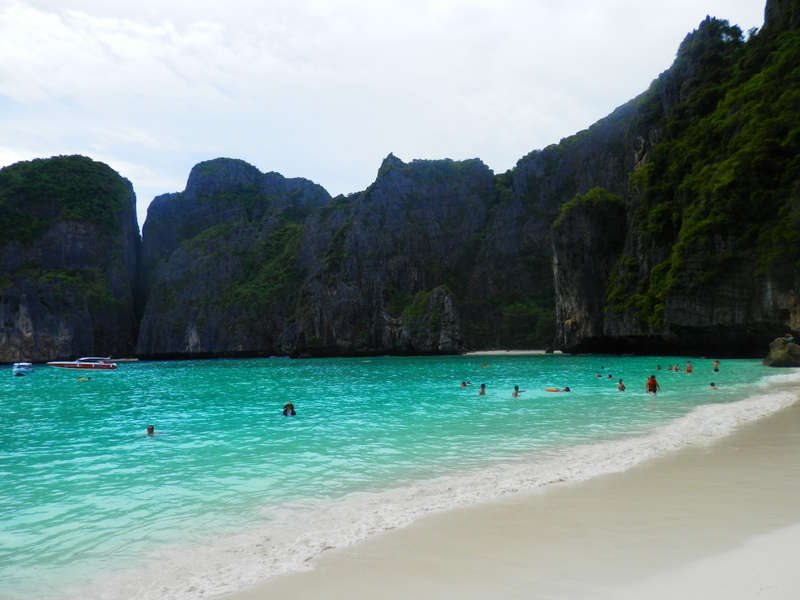 One full day I spent on a popular tour to Phi Phi Island. This was a very people-dense tour, and is one of the most promoted activities in the area, but I would recommend it all the same. 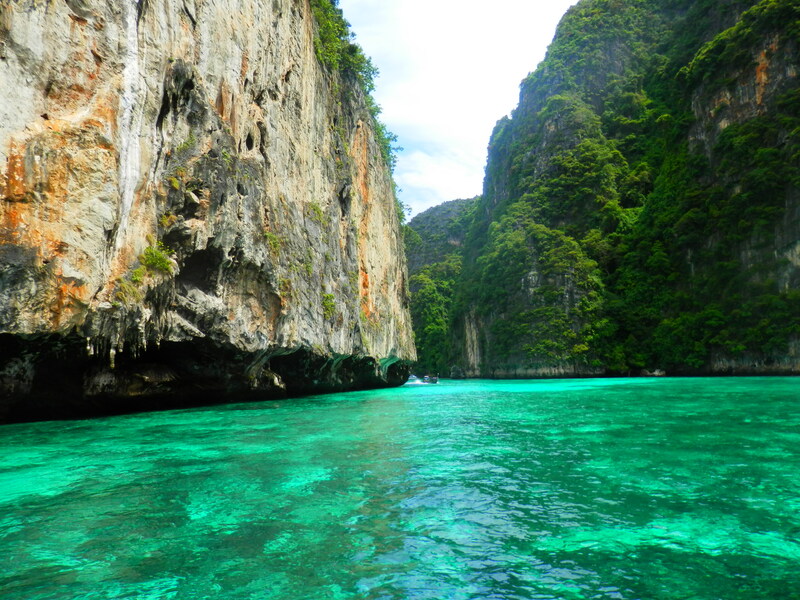 You go island hopping by speedboat, see monkeys on Koh Phi Phi Don island, snorkel in turquoise-clear waters, and visit the massive tourist attraction of Maya Bay where the film ‘The Beach’ was shot. I had a wonderful time and met some neat people, not to mention was stunned with the beautiful sights we visited – despite the intermittent rain. Being back on the water again was incredible; years ago my parents were part-owners of a pretty decent boat and some of the best times I’ve had were out on the ocean. Taking the speedboat around the islands was fantastic fun – the feeling of zooming over glassy waters must be comparable to flying. I also really loved the Thai staff. After over a month of hanging out with mahouts that hardly spoke English, it was nice to again be around locals and not just western tourists. They must have enjoyed my company too and pretended to kidnap me after the tour was over, picking me up and carrying me back to the boat! I think I needed that day of fun after feeling so utterly overwhelmed at being in Phuket. T he rest of the time I relaxed with the other WFFT volunteer by the pool and at the beach, drank cocktails and had a couple of massages. Sounds like paradise, huh? Like I said; a while ago it would have been my perfect holiday, but now it just doesn’t grab me in that way. I couldn’t stop thinking about rural Thailand, the animals at the Centre and the great people, and I realised that if I couldn’t go back there then I was definitely ready to head to home. For my final night in Phuket I again went on a pre-booked tour. This was an evening trip and all I knew was that I was going to have a buffet dinner and watch the ‘Phuket FantaSea’ show. My travel agent told me it was a must-see, but did mention that elephants were involved. You may know by now that I am one for putting my hand up to do things for the sake of my own education and awareness even though it may upset me – like visiting the Tiger Temple early on in my Thailand travels. It would be the first time that I would see ‘working’ elephants in Asia. I knew the show wouldn’t make me happy, and that I would more than likely get angry at the situation, but it’s one of those things I had to see for myself. So I went ahead and booked. The driver picked me up from the resort along with a group of other tourists. I immediately started chatting to a family that turned out to be from New Zealand – one of the women lives on a street just around the corner from my childhood home; unbelievable! It took at least half an hour to get to where the show would be, and as we pulled into the carpark I just about fell over; there were so many people milling around. 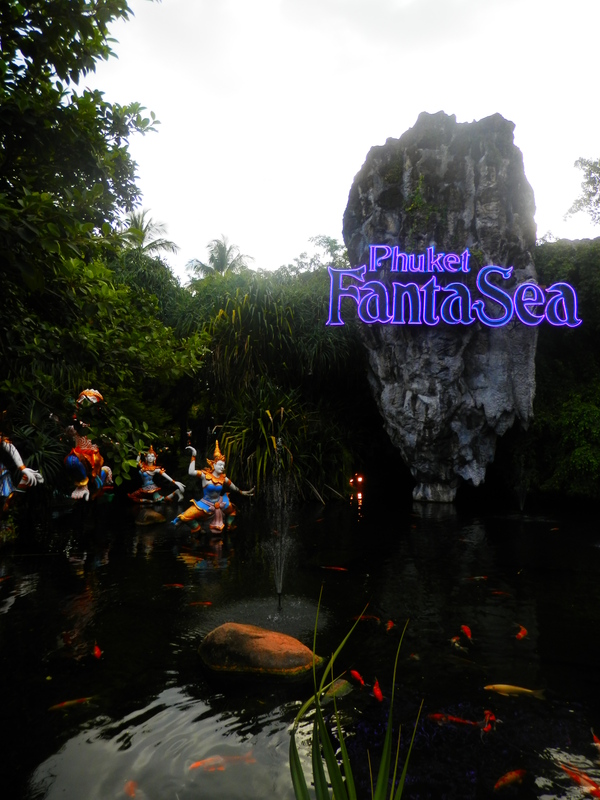 I hadn’t researched Phuket FantaSea before going, so didn’t really know what to expect. If I had thought Kata Beach was packed, it was nothing compared to this. There were people of all ethnicities absolutely everywhere. The driver dropped us off, and we were on our own to figure out just what we were meant to be doing. Some Thai staff made-up in fancy traditional costume smiled and waved us in the direction of the ticket booths, and we soon made our way up to the counters to be told what to do. I thought I had booked for the 6pm show, but I was given a ticket that had the time of 9pm circled, giving me over three hours to do… what exactly? I headed over to the entrance, joining the throngs of people entering the gates. I was a good head taller than most, and could easily see the massive wave of tourists pouring through the entry. Once again I was wholly overwhelmed. We bottlenecked our way through the gates, attended by smiling employees in heavy makeup and shimmering costumes. Out on the other side I was greeted by a very colourful and cartoon-like “WELCOME” sign – I kept wondering what exactly I had walked in to. On either side of the road there were large buildings that looked like movie sets or something from Disney Land; caves with gaping mouths, massive treasure chests with glittering golden trinkets calling to be bought, huge animal faces with their jaws widened into a giant entrance-way. It seemed I was surrounded by stores and side-shows, and I suppose the point was to have people wandering around spending their money before and after the show. The area was pretty large, and I walked around not feeling entirely sure how to pass the time (I didn’t feel like paying for over-priced souvenirs). The Phuket FantaSea theme music was playing over and over in speakers throughout the whole complex; it started bugging me after a while because I just wasn’t in the right mood for this whole set-up. I looked at a few side-shows, staring in wonderment at all the different themes and creations. Then I walked around a corner, and suddenly stared ahead of me. Spread across one side of a courtyard, before an elephant-themed water fountain, was a huge formation that resembled a temple. “Palace of the Elephants,” it was called, and trundling beside it was a gorgeous decorated elephant, a ‘golden’ seat atop her back tied with a rope under her tail and neck. The Thai handler sitting above her carried a bull-hook in his right hand, and used his feet to constantly kick her ears, making her give the appearance that she was waving them. I walked further into the courtyard, and was immediately passed by another gorgeous female elephant dressed in colours and gold. The elephants are, of course, paraded around as magnificent beings honoured to carry humans atop their backs. Tourists flocked to pay for rides, and were encouraged to buy an ‘action shot’ of the elephant posing with them still in the seat. There were at least six elephants being used for rides and posing for pictures, and you could buy a bucket of thick sticks to feed to the girls. When they weren’t walking or posing, the elephants were kept behind a chain-link fence with their handlers still riding them. Crowds stood around them, holding their trucks for photos and laughing as the handlers got them to dance. The New Zealand family I had met in the cab over joined me, and one of the women pointed to one of the elephants and noticed she had ‘bits hanging off’ her ears. She looked to me for an explanation, and I asked if she really wanted to know. Most of the elephants had torn ears – from Phajaan (please visit the link if you don’t know what this traditional ‘domestication’ method is about) and their training. I’m sure I ruined that poor family’s night with all the horrible stories I told them! Despite being very attractive elephants, their faces (especially their foreheads) were spattered with deep scars – probably stab wounds from bull hooks and the like – and there were small abscesses and pressure-wounds behind their ears. It is not something you would notice unless you were particularly looking for them, though, and most of the comments I heard from tourists around us was how happy the elephants looked. One of my new friends asked me in a hopeful manner if I agreed that they were content – but how could I? When I looked into their eyes I didn’t see pain or fear; I saw nothing. I remember sitting with the wolves at the White Wolf Sanctuary – in the bitter animals you could see anger, and in the ones who had forgiven us I felt like I could reach right into their souls and they would do the same with mine. But with these elephants I just couldn’t reach anything. It was similar for many at the Wildlife Friends Foundation Thailand’s rescue centre; I’m sure some of the elephants had simply had the life beaten and worked out of them. So no, I could not tell my friend I thought the elephants were happy. 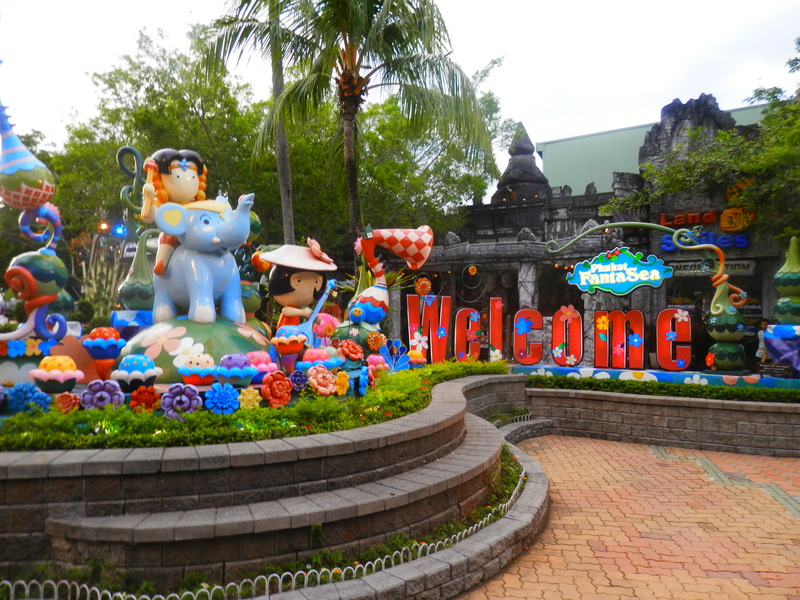 I don’t know where the Phuket FantaSea’s elephants are held overnight and when they aren’t working, and I wonder what their living conditions would be like. Also, their training never stops – and I know kindness does not make up the entirety of their exercises with the handlers. 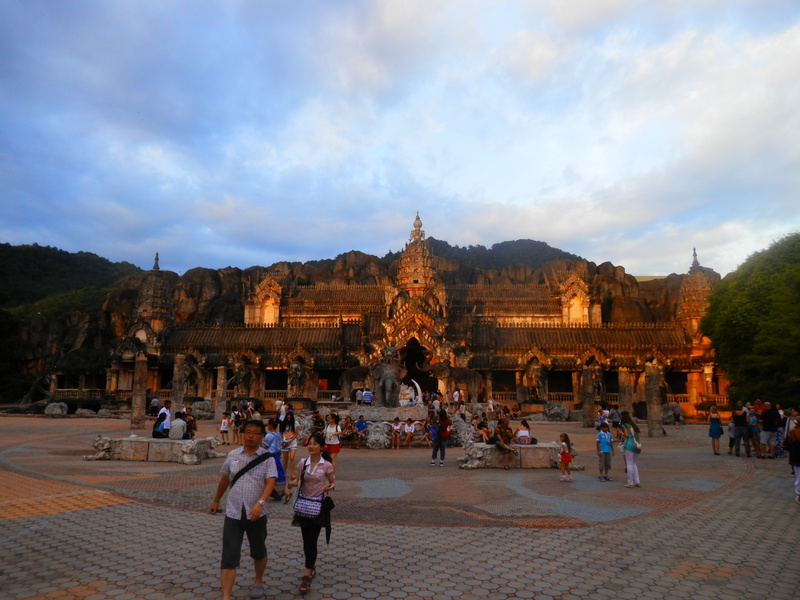 After the buffet dinner, I again joined a multitude of tourists and was pulled up to the entrance of the Palace of the Elephants, now shining copper in the low evening light. It made me think of an Indiana Jones set – huge boulders and vines carved ways for us through the entrance hall, sounds of an exotic jungle echoing through invisible speakers. The immersion really was great – it is something we strived to achieve at the Zoo I used to work at; you want people to feel a part of what’s around them, to truly involve them. And we were made to feel as though we were on some exciting adventure, a cultural safari, about to see some amazing sights and witness some rare treasure. Signs pointed us towards the counters, and others warned that we would have to hand any photography and recording devices over. Photos of celebrities hung on the walls with FantaSea staff and – alarmingly – small tiger cubs and elephant babies. I walked up the single-file aisles, passed through the bag check and went around another corner into a large room just before the theatre. There were different sets on either side, at first with Thai staff in traditional dress beckoning visitors to have their photo taken, and then I came across the animals. There were several tiny tiger cubs chained to pedestals. Not one was unoccupied – there were people holding a bottle of milk out in front of each one. I didn’t look at the prices, but I know you could pay a one-off fee and get a framed picture of a digital photograph. Next to the tigers were two baby elephants. They were tiny – only a third of eight-year-old Khan Kluey’s size if that. The whites of their eyes showed as they swayed from side-to-side as our own KK was trained to do on the streets. They would hold up their trunks, or a front leg for people to touch as they posed for a photo. I felt sick just seeing them. Not long ago they had been ripped from their mothers, tortured to teach them to obey without question, and this is now their life. Just for our simple, cheap entertainment. I took my seat in the theatre on a plush purple chair. The theatre was even more decorated that the entry, with fake trees towering up to the ceiling and lights like stars dotting the roof. The show started about half an hour later than scheduled (I suppose people were kept pretty busy outside), but when it began it started with a bang. There was an eruption of loud music, dancers came through side entrances behind my seat row twirling sticks of fire, and then came the elephants. The show was full of costumes, orchestrated melodies, dancers, acrobats, demonstrations of martial arts and weapon fighting, and then came more animal scenes – goats were run across the stage, chickens, a donkey, an ox with a ring through his nose being pulled by a man with a rope, and again the elephants. The acted out a war in which they were ridden to glory, and then came a scene where children celebrated them by chasing them in a circle and pulling their tails. 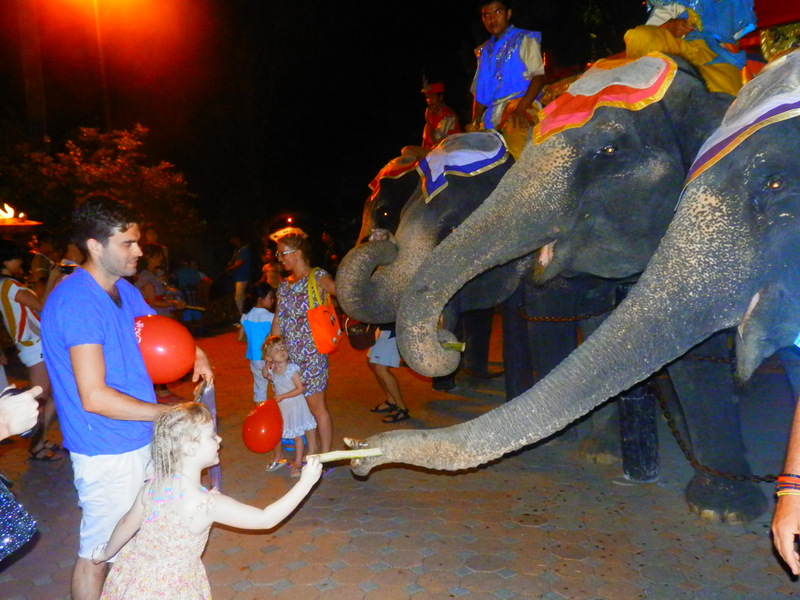 The people clapped at the elephants, holding animal-shaped balloons and singing their praises. Then the elephants were made to do tricks – stand on stools, climb onto each others backs, twirl around, shake their legs, shake their trunks… anything and everything unnatural. The music changed to a circus-like instrumental, with performers clapping their hands and encouraging the crowd to do the same. The more I saw the more I hated it. I counted almost twenty elephants, some males, all being made to do ridiculous acts while people laughed. I later told my friends back home that I must have looked like an idiot – I was sitting there in my chair with tears in my eyes as everyone around me clapped and laughed. The music was comical; the point of the scene was to get people to laugh at these creatures that are apparently celebrated, and yet were being humiliated. What was truly being celebrated was the ability of humans to bend the will of these creatures and get them to do what we ask – even if it looked utterly absurd and degrading. I left the show speechless, with wide eyes. I just wanted to get out of there. Outside I saw more of the elephants – this time they were undressed. They stood in a line behind their chain fence. Someone had emptied a bucket of sticks on the ground for them to pick at. I silently thanked them, and apologised for their lives of servitude. Then the handlers began yelling for me to take photos. Instead I took a video of them dancing, and of their ears being held in place. The Thai staff just smiled and waved at people. Video is below. By now you will know my stance on this sort of thing. I left Phuket FantaSea disgusted, and I left Phuket the next afternoon ready to be out of there. If I had the choice I would have gone back to Rural Thailand, straight back to rescued animals. But, I’m back home, and awareness is a powerful tool. I am grateful to anyone who bothers to read these blog posts, and I hope you spread the word to future travellers – let’s not give in to cruel tourist thrills that cost lives. We are better than that, and so are the animals. Thanks Sam for information on the treatment of the animals at Fantasea it was recommended to me yesterday by someone who has just come home after being there Will not be going there now !!! Hi Patricia, thank you for getting in touch – and it’s great to hear that you were deterred from going to Fantasea! I don’t see them changing the way they exploit animals any time soon, so it’s really good to know that there are people out there who care enough to give it a miss. I would love to get up to the Elephant Sanctuary – I have heard really good things from friends who have visited or volunteered there. Wow, Such a detailed post. I love animals and dislike them being treated unfairly. Sadly I am not educated enough on the true workings behind the scenes that demesticate wild animals for our pleasure. Part of me thinks “it can’t be that bad, they get fed and care daily in return for there time” but as you put it what animal would want to be beaten to obay to then be paraded around repetitively. I saw my first elephant up close in Dalat and was happy, sad and confused. Why is this elephant here alone and is it really happy being here? I could not feel anymore empathy for this elephant, but there was not much I could do than to scilently say my sorrys and offer my love. Regarding Phuket Fantacy I was considering booking, as a thing to do. But reading this has made me aware, me booking would add demand and then the they have to supply which is not helping. Its sad such thing will still happen if I book or not. Thank you so much for visiting the blog, and for leaving a comment. I really don’t think it is acceptable to torture an animal for the purpose of human entertainment – and animals in the tourism industry in many countries such as Thailand are tortured. It is so nice to hear from someone who has compassion for other species. Thank you for caring – I believe elephants have a huge capacity for suffering, and it is good that you consider what you support when you are traveling – even though you are only one person it does make a difference. So thank you very much. I am heading to Phuket next week, do you know if there are any rescues or sanctuaries to visit? I do not want to support the commercial industry. Great article. Will be going to Phuket in a few weeks, and will definitely skip the Fantasea show or any elephant trekking tours. 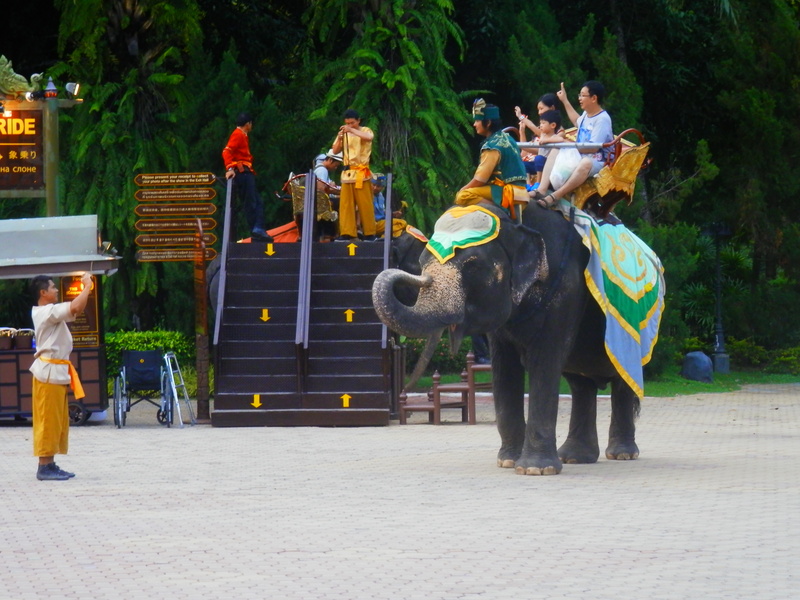 There are two Elephant sanctuaries in Phuket, although quite far from the Patong area. They both offer volunteer day trips for similar prices. You get prepare meals for the elephants, feed them and bathe with them. Thanks so much for that information Susana! Enjoy your trip. Thank you so much. 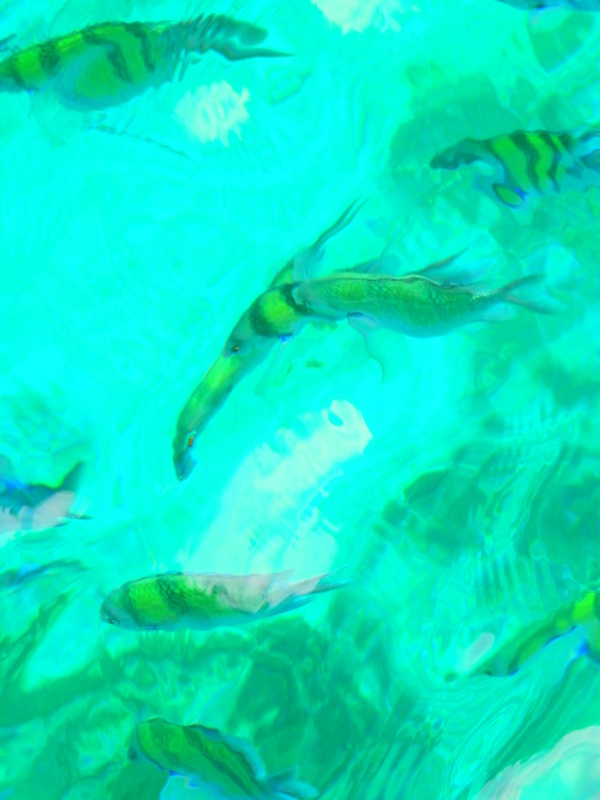 I have been doing tonnes of research to find the positive tourism in phuket, and had heard very mixed reviews of Fantasea. My travel agent recommended it… Now I know the truth and know I would be in tears before the show even started. I will avoid this. Do you have any positive animal based interactions in phuket? I have found sanctuaries and reserves in North Thailand but we are only in phuket for 4 days… Thanks for your account. Thank you so much for stopping by, and for taking the time to leave a message, it’s awesome to hear from someone like you. Unfortunately my time exploring Phuket was fairly limited – it has SUCH a huge tourist focus that I really doubt there are any legitimate animal rescue establishments within that area – but as I say, I wasn’t there too long to really look into things. It is a stunning place, just be wary of the folk who will beg you to pose for a picture with some kind of creature they have in their possession. Get in touch any time. I have just left fantasea, it was disgusting….I thought to myself “am I the only person in this show on the verge of tears!! The music was so loud,the pyrotechnics, the cannons boom..those poor elephants having to be subject to that.. I would never have gone had I known the elephants would be subject to that cruelty!! Fantasea I feel has ruined my entire holiday here in phuket..
It’s not a bad thing to feel this way Tracy. It’s good that you can look past all the lights and sound effects and dazzling costumes. Those elephants have been through literal torture to get them to perform that way, and it is just because people will pay money to see it. It doesn’t need to ruin your holiday, though, just be aware of what you endorse while you are over there. Phuket is a beautiful place, but unfortunately animals are used inappropriately and abused in order to make money from tourists. How can we stop this! Hours ago I left fantasea halfway through in tears it’s aweful how can we help??? Jess, thank you so much for reading and for commenting. I know exactly how you feel. As disgusting as the show is, it’s amazing that you saw past it and are looking at ways to help. Money fuels and drives these ventures. Most people who pay money to visit such attractions have no idea what they are funding. This is why awareness is so important. Tell your friends, tell your family, if you have a Facebook page put some posts up calling people to educate themselves before they travel. Encourage them not to support this sort of entertainment. I really believe awareness is a powerful thing. You can sign petitions against the show – e.g. http://www.thepetitionsite.com/832/389/926/stop-the-animal-abuse-in-thailands-fantasea-tourist-attraction/ – write letters to animal welfare groups calling for action, and of course make a personal pledge that you will not support anything like this. I encourage people to go and donate some time to rescue sanctuaries when they travel. Then not only are you not supporting animal abuse, you are actually contributing to a solution to this very complex problem. Thank for sharing your good experience . An Elephant is Animal warriors of Thailand. Thai people love and focused of them. Hi there, thank you for visiting this blog. I definitely think people have different views on Thai elephants – I do not agree with them being used in tourism ventures, circuses or other performances, etc. Well said Samantha. I am reposting this page on my blog – raveburbleblog. I hope you’re okay with that. Anything that helps tourists make more ethical choices is great in my books. I volunteered at Elephant Nature Park in Chiang Mai, North Thailand last year and have several posts on my blog about them and wonderful deeds, and about my experience there. I am going back to volunteer in September. Take care and keep on blogging. Thank you very much for stopping by and for your kind comment. I’ve had a look at your blog – love your work! We’re pretty similar in many ways huh :) You’re absolutely welcome to repost whatever you like. Looking forward to reading more of your adventures.